Insouciance is a characteristic thatâ€™s been lodged against coloured people of the Cape for years. In April 2018, however, G@tvol Capetonian arrived to put that allegation to bed and fight for the coloured community. Emerging amidst a leadership crisis in Cape Town and the Cape Flats specifically; the politicians donâ€™t care and the people who â€˜make itâ€™ leave, only coming back for Eid and Christmas lunches. I sat down for an interview with Oscar Lyons, Fadiel Adams, Randy Nel, Junaid McCleod, four members of G@tvol Capetonianâ€™s executive team. G@tvol Capetonian are illustrative of the extent coloured people, a race-crazy countryâ€™s inbetweeners, will go to in order to be seen and have their concerns heard and resolved. Theyâ€™ve swiftly rallied thousands in the Cape Flats community thanks to their goals of having an independent Western Cape and expelling black Africans whoâ€™ve journeyed from the Eastern Cape post-1994. They allege that some black people are being given title deeds while coloured people remain on the councilâ€™s housing waiting list and the â€œelderly continue to live in hokkies and wendy houses,â€ Fadiel Adams said, who is a co-founder and main spokesperson for the group. â€œThe mere fact that high-school dropouts, ex-drug abusers and people who canâ€™t articulate themselves, the mere fact that we have arisen. Somebody asked a question not too long ago, one of our Facebook enemies asked, â€˜Is this movement the very best the coloured community has to offer?â€™ and I responded by saying, â€˜No, we are by far not the best, but why donâ€™t you point us in the direction of the best people and leaders in our so-called coloured community? Weâ€™ll go and find them and weâ€™ll tell them to take over,â€™â€ said Adams. So many people who fought for our freedom are representative of the nation â€“ there is a hero for every demographic â€“ and these include coloured freedom-fighters like Ashley Kriel, Imam Abdullah Haron and Dulcie September. However potential heroes and leaders have either dashed for the southern suburbs or no longer see public leadership as enough of a cause. 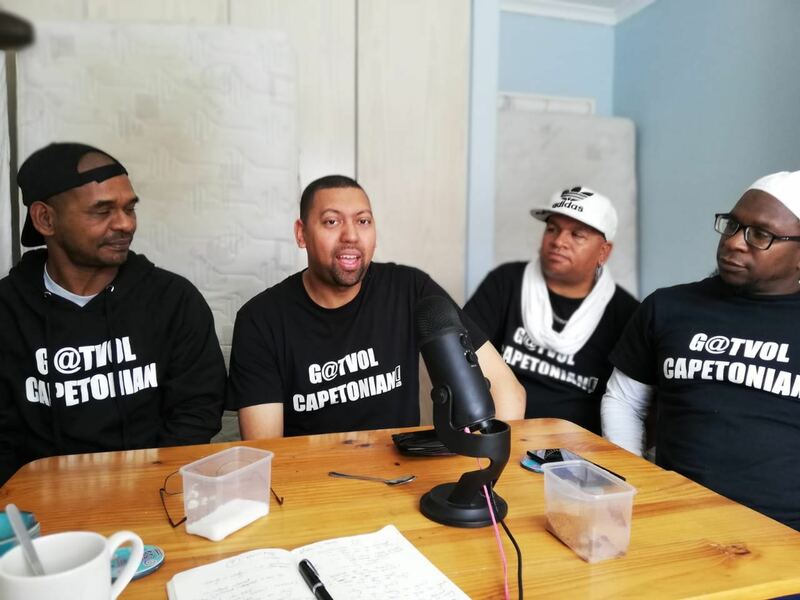 G@tvol Capetonian argue that the leaders of today donâ€™t know the reality of the Cape Flats and therefore cannot properly govern in its best interests. The Cape Flats â€“ a vast part of Cape Town named after the flat ground on which its built, includes areas such as Mitchells Plain, Hanover Park, Lavender Hill, Athlone, Manenberg and more â€“ is, according to G@tvolâ€™s estimates, home to more than a million people. And whether your estimates are more conservative, their point that there is a concentrated populous living in terrible and often deadly conditions shouldnâ€™t be lost. However, itâ€™s not as simple as it may seem. Randy Nel explained in detail how one of apartheidâ€™s greatest successes was to distort the minds of coloured people. It was, after all, because of the coloured vote that the National Party won the Western Cape provincial elections in 1994, followed by the New National Party and Democratic Partyâ€™s 1999 coalition victory. Following an unsuccessful Ebrahim Rasool-led ANC rule from 2004 to 2009, the Western Cape opted for the DA (successors of the Democratic Party), whom they have since stuck by. Allegations of racism have been readily lodged on social media against G@tvol Capetonian â€“ anti-blackness remains pervasive in coloured communities â€“ and while politics may not reveal everything, this voting history is telling. The psychological bullying of not-black-enough-not-white-enough thrived in apartheid and remains subversive and ever present today. Some notable coloured public figures and academics like former Robben Island prisoner Neville Alexander, rejected colouredness as an identity outright and declared themselves Black. Coloured people make up 8.9% (as per the 2011 census) of the national population but a majority 42.4% of Cape Town and G@tvol Capetonian stress that coloured people shouldnâ€™t be treated like a maligned minority in their own city. However, bubbling under the surface are the privileges coloured people enjoyed under apartheid that black people did not. Do coloured people need to wait as the scales are equalled, or can that be done concurrently? There is no consensus yet but the debate continues to grow in the public sphere and with G@tvol Capetonian officially announcing that theyâ€™ll be running in the 2019 elections, it will certainly accelerate. For a multitude of reasons, many coloured people donâ€™t feel they fit within the boundaries of blackness as an identity and have reclaimed â€˜colouredâ€™ like African-Americans have reclaimed â€˜niggerâ€™, Adams said. This opens the door to many questions, was the rejection of the ANC in 1994 because coloured people didnâ€™t want to vote for a black party? Was there distrust and already a belief that the ANC had sold out during CODESA? Was there an aspiration for whiteness, hence the trust of whiteness ala NP, the very party that forcibly removed coloured people from their homes and put them in the Cape Flats? â€œWe stoned the NPâ€™s cars, trucks and buses and ended up voting for them. I donâ€™t know how, I need to apologise to my children that some people I know voted for the the NP. I donâ€™t like the term coloured but I donâ€™t discourage others from using it. Weâ€™ve had a so-called coloured premier, a so-called coloured mayor, a so-called coloured MEC for social development and weâ€™ve had various sellouts in various positions. I would like to know from all of them if they could collectively tell me three things theyâ€™ve done for the so-called coloured people. Because you know what happens once you get that chain? You become just another baas-boy. Once they give you the keys to that Audi or BMW, youâ€™re just another nothing. Iâ€™m the first to admit that our approach and model is not perfect, but if you have a better plan by God, come out and show us. This is what we have, if you can do better, by all means my seat is yours,â€ he said. Whether all coloureds, most coloureds or any coloureds truly want an independent Western Cape or the expulsion of black people is debatable â€“ on the grounds of its almost-vacant plausibility at least. What rings true though, is that â€œprogressive countriesâ€, Oscar Lyons said, â€œtake care of their minoritiesâ€.